Multi-use trails allow a wide range of transportation methods in urban areas. They support active transportation users of many kinds, including pedestrians, cyclists and people using devices such as scooters, in-line skates and skateboards. Multi-use trails that are not purely recreational may still enable users to travel safely within a community, away from roads. These are most often paved surfaces and should be accessible unless the location makes it infeasible. Due to their higher levels of traffic and more diverse usage needs, multi-use trails have additional design considerations over other types of trails, such as nature trails. There are two primary areas of consideration for visual accessibility of multi-use trails: the design of the trail itself and the intersection design (i.e., both where trail routes intersect and where multi-use trails meet roadways). Larger trails may have multiple lanes of travel, which could be one-way or in opposing directions. If present, lanes should be clearly demarcated, preferably by physical separation strips built into the trail. Separation strips should ideally be attention TWSIs, but this may not be feasible over extended distances. If not feasible, separation strips should be a cane-detectable material in a contrasting colour and texture to the trail surface. Where the provision of physical separation strips is infeasible, a painted centre line should be used, contrasting in colour to the trail surface, with a slip-resistant finish. Buffer zones are obstacle-free spaces adjacent to multi-use trails that are meant to be used in case of emergency situations or falls. They are not required by all design standards, but may be present as either a flat grass surface or paved shoulders within high-traffic areas. Buffer zones should be clearly demarcated from the functional trail surface. The edge between the buffer zone and the trail should be cane detectable. Some trails also incorporate pavement markings, such as directional arrows, word markings and symbols, around areas of caution or interest. All markings should be large, clearly legible and distinctly contrasting in colour to the trail’s surface. Paint used for marking should be slip resistant. Information provided on the trail through surface markings should also be provided through signage at appropriate locations that is readable visually and through touch. As in nature trails, informational boards or detailed signage at trailheads and other key locations should feature tactile and braille elements, ideally with a cane-detectable, contrasting surface around them to indicate their presence. Other elements provided along multi-use trails, such as washrooms, rest areas, drinking fountains and emergency telephones, should comply with good accessibility practices as specified elsewhere in this resource. At trail crossings, signage that meets requirements should be used to aid wayfinding. A cane-detectable surface of contrasting colour and texture throughout the intersection area is recommended. Pavement markings prior to reaching this area could also provide further warning before entry, particularly in high traffic areas. Intersections at vehicular roadways, sometimes known as crossrides, should be clearly demarcated with a contrasting colour and/or surface to ensure visibility. As with regular crosswalks, TWSIs are recommended where crossrides begin. Wherever possible, crossrides should be signalized with an APS system. 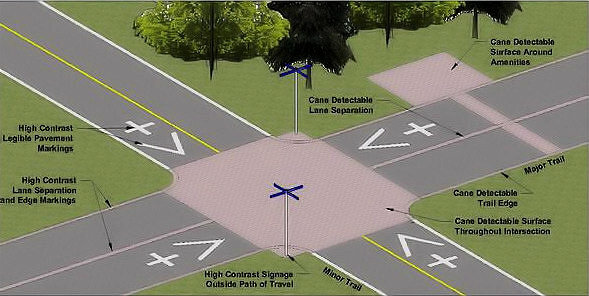 Trail traffic may be diverted to an existing intersection where crosswalk infrastructure is already present. If this is the case, the trail diversion route should be clearly indicated. Where offset gates/railings are used at crossrides to slow bicycles and other traffic, they should be cane detectable and colour contrasted.